Washington’s wolves have been in the news again this summer. While infrequent conflict between wolves and livestock is not unexpected, it’s never easy. For Conservation Northwest, that’s especially true when these conflicts involve ranchers with whom we’ve worked for years to help build acceptance of wolves in rural areas, as was the case with the Smackout Pack earlier this year. But behind the headlines on depredations and dead animals, a deeper and more inspiring story about wolves and people in our state is unfolding. It’s one that bridges cultures and communities to find common ground and, eventually, coexistence. And with your support, our organization is a leader in advancing this work. The return of the wolf is just one of many budding wildlife success stories in the American West today. But without buy-in from the people who live with and around wolves, that success remains tenuous. Reasonable compromise on all sides will always be necessary. Around the world, working together and building understanding across stakeholder groups, indeed across cultures, has been shown to create more enduring conservation solutions than when people go off to their corners to fight through words, lawsuits and personal threats. It takes respect, listening and a willingness to collaborate and compromise, but many folks in our state are working with their neighbors to create a future of healthy wolf packs that can coexist with vibrant rural communities. For all the sound and fury everywhere else, Washington is where wolf recovery is being done right. It’s a wildlife conservation model that others ought to follow. Like much of our conservation work, this approach to balancing the sustainable return of healthy, thriving wolf packs with the needs and values of those living alongside them is difficult, and at times, counterintuitive. But that doesn’t make it any less vital. America is divided right now. We see it in the headlines, we see it in our communities, and especially in our digital conversations. These divisions have a drastic effect on our nation’s policies, conservation issues prominently among them. 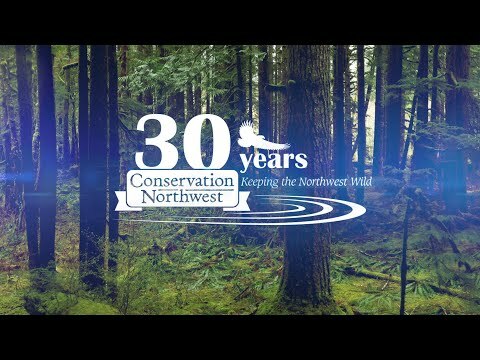 But for nearly 28 years, Conservation Northwest has been a leader in bringing people, stakeholders and government together to advance practical solutions for wildlife, wildlands, and our shared natural heritage. We’ve never been afraid to sit at the table with those who are different than us, even when common ground seems elusive. Wolves need this, and so does our country. Culture war and divisive tactics may work for headlines and fundraising, but they rarely help wildlife and wilderness in the long run. And in the case of wolves and other native carnivores, the resulting polarization leaves them vulnerable to rural anger, poaching and legislative repercussions. I’m proud of the work Conservation Northwest is doing to advance the goal of recovery and public acceptance of wolves alongside thriving rural communities. Through our Range Rider Pilot Project, our participation on the Wolf Advisory Group (WAG), and our relationship building from the state capitol to the small towns and wild places of our region, we’re stewarding not just the return of the wolf—together we’re blazing trails towards future progress as well, for both human and wild communities, in Washington and beyond. With your support and thoughtful understanding, we’ll continue to do so for many years to come.